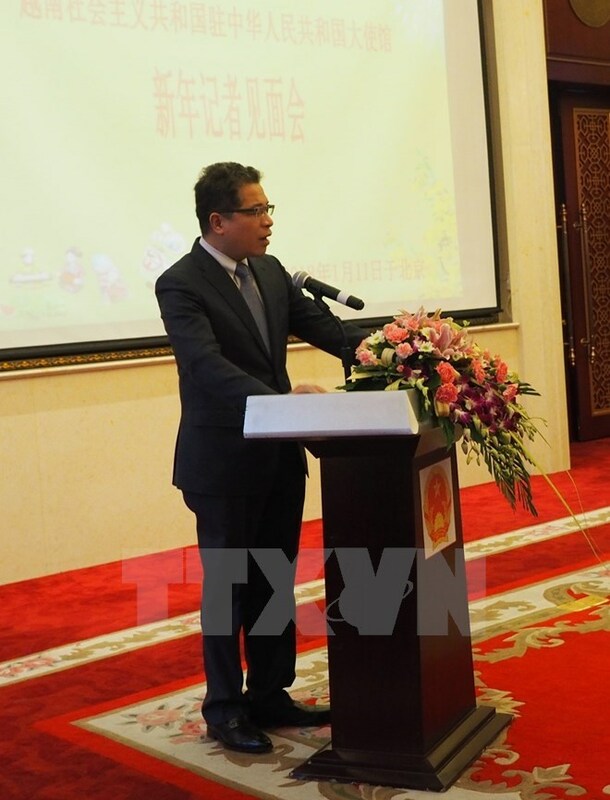 Beijing (VNA) –Vietnamese Ambassador to China Dang Minh Khoi has applauded China’s press and press management agencies for their wide coverage of Vietnam as well as relations between the two countries. He met with reporters from China’s major media agencies and newspapers like Xinhua, People’s Daily, China Central Television, China National Radio and China Youth Daily, and representatives of Chinese press management agencies in Beijing on January 11. The ambassador used the occasion to brief the Chinese media on Vietnam’s major socio-economic achievements and big strides in the Vietnam-China relationship in 2017, as reflected through high-level meetings and visits of the two countries’ leaders. Khoi highlighted the visits to China by General Secretary of the Communist Party of Vietnam Nguyen Phu Trong in January 2017 and President Tran Dai Quang in May 2017. Most recently, General Secretary of the Communist Party of China (CPC) and President Xi Jinping visited Vietnam and attended at the APEC Economic Leaders’ Meeting in November 2017 attach to ties with Vietnam. General Secretary and President Xi Jinping’s selection of Vietnam as the first country to visit following the 19th National Congress of the CPC reflects the importance the Chinese Party and State, as well as Xi Jinping himself attach to the Vietnam-China relationship in particular and relations between China and its neighbouring countries in general, Ambassador Khoi said. The diplomat noted that bilateral trade value has surpassed 100 billion USD and the number of tourists travelling between the two countries also saw strong growth, with 4 million Chinese tourists visiting Vietnam and 3 million Vietnamese holiday makers choosing China for their trip in 2017. Mentioning the outstanding maritime dispute between the two countries, Ambassador Khoi stressed that both sides have showed their determination to maintain peace and stability at sea, adding that they had worked together with ASEAN member countries to approve the draft framework of the Code of Conduct in the East Sea (COC) in 2017 and speed up negotiations to build an effective COC. The ambassador also pointed to existing problems in bilateral trade and investment ties, but said that he believes that they will gradually be solved in the coming time. He informed that that PM Nguyen Xuan Phuc has invited his Chinese counterpart Li Keqiang to pay an official visit to Vietnam and attend the Greater Mekong Sub-region Summit scheduled for March 2018 in Hanoi during their recent meeting in Cambodia.